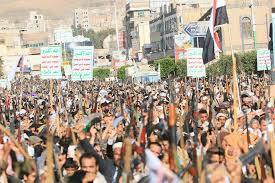 The Organzation Committee for the events calls the Yemeni people to participate in the mass rally “No to US Terrorism on Yemen” next Friday in the capital Sana’a. The organizing committee emphasized that participation in the mass rally is really important to deliver the voice of the Yemeni people and their suffering to the world opinion and rejecte the American terrorism. The place will be determined later.